University Statement: Death of Father Robert Kaslyn, S.J. Rest in Peace: Father Robert J. Kaslyn, S.J. It it with great sadness that The Catholic University of America mourns the unexpected loss of Father Robert J. Kaslyn, S.J., associate professor and former dean of the School of Canon Law. 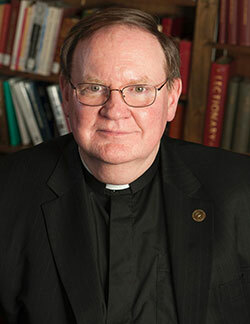 Father Kaslyn, 62, died peacefully at Georgetown Hospital on Wednesday, March 13. Robert Kaslyn was born April 19, 1956, in Hackensack, New Jersey. He was ordained to the priesthood on June 8, 1985, by Cardinal John O'Connor, the Archbishop of New York. Father Kaslyn was a member of the Northeast Province of the Society of Jesus. Father Kaslyn earned a B.A. in history and philosophy from Fordham and his S.T.B. and S.T.L. degrees at Regis College, Toronto School of Theology, University of Toronto. He earned his doctorate in canon law from Saint Paul University in Ottawa. His doctoral dissertation was published as “Communion with the Church and the Code of Canon Law an Analysis of the Foundation and Implications of the Canonical Obligation to Maintain Communion with the Catholic Church,” with a foreword by Cardinal Avery Dulles, S.J. He taught canon law at the Weston School of Theology in Cambridge, MA, and served as a judge of the Diocesan Tribunal in Worcester, MA.